Having to control what I eat is certainly dampening my spirit lately. I can't enjoy my chocolate treats, nor drink Milo, or anything that will threaten to shoot up my blood glucose level. 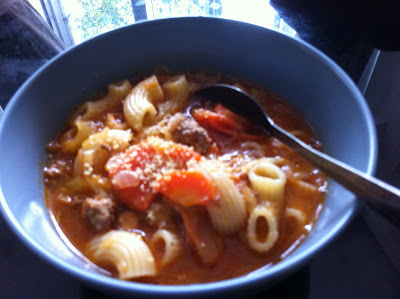 So to cheer me up and also because I want to reduce my rice intake, I decided to make a delicious, hearty yet healthy soup that packs a punch of nutritions from a variety of veggies, minced meat and a dash of macaroni pasta for the carbs (because carbohydrates are still needed but in smaller quantity for a diabetic). This soup is really a complete meal on its own and a delish pick-me-up on cold weather like now. Actually, I modified this recipe slightly to make it simpler and because I don't normally have olive oil, basil and parsley at home. Also, I skip leeks because I don't really like its strong flavour. For protein, I add in minced meat. For those who don't have liquid chicken stock, you can also replace this with the chicken stock cube and just add water. This recipe is ridiculously simple and quick to prepare - thanks to my new food processor, the chopping and shredding of onion, celery stalks, carrots and cabbage take only 5 minutes. The first thing to do is to melt the butter (you can substitute it with margarine for a slightly healthier version, or you can skip this altogether and just use vegetable oil) and add oil to sauté the minced meat until it's brown. Then add in the onion and crushed garlic, sauté until the onion caramelized before adding in celery, carrots and tomatoes. The vegetables are then left to 'sweat' under covered lids for approximately 10-15 minutes (or until the tomatoes soften) before adding in water and a cube of chicken stock. Leave to simmer / until the vegetables are tender before adding in tomato puree for that sweet and sour punch. Add in salt, blackpepper and for me, dried Italian herbs. Leave to simmer until the flavours blend well. The final step is to add in the macaroni. When the macaroni is cooked, that's when the soup is ready to be served! Even Khayla enjoys the soup (but she only takes the soup and not the macaroni or any visible veggies!) which is a good way to get her to eat up her veggies. Perhaps it has something to do with the tomato-based soup that makes it yummy to an almost 2-year-old like her! Karni, macamana la hang boleh kena diabetes waktu pregnant ni? Aku rasa hang ni adalah orang yang sangat2 menjaga kesihatan. Baby hang berat dah berapa? diabetes tu tak de kaitan dgn berat badan pun. Ada org kurus pun kene diabetes jugak. Aku naik smp skrg baru 10kg. baby aku @ 36wks 2.6kg. Growth dia ikut chart, weight gain aku pun still under control.